The Capital Asset Pricing Model is a theory developed by William Sharpe, John Linter and Jack Treynor in the 1960s. The model describes the relationship of the expected rate of return as a function of the risk free interest rate, the investment's beta, and the expected market risk premium. The Market Risk Premium is defined as the Expected return of Market minus the Risk free rate. This worksheet uses the Expected return of Market and Risk free rate to calculate the Expected return using the Capital Asset Pricing Model. This worksheet uses the Market Risk Premium to calculate the Expected return using the Capital Asset Pricing Model. 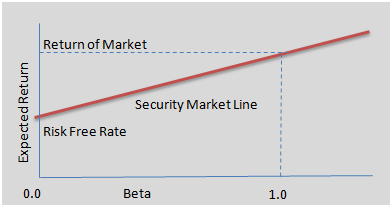 The Security Market Line can be thought of as the graphical representation of the Capital Asset Pricing Model. It illustrates the concept that it is possible to obtain any combination of risk and expected return along the slope of the graph by investing some portion of your investment in the market portfolio and borrowing the rest. The Security Market Line is useful for determining whether an investment in an asset offers a good expected return for the risk taken. By providing the Beta of the asset, the Risk free rate and the Market Risk Premium, we will be able to plot the asset on the Security Market Line graph. If the Expected return versus Beta of the asset is plotted above the Security Market Line, the asset can be thought of as being able to provide a greater return for the inherent risk. An asset with a point below the Security Market Line can be thought of as getting less return for the amount of risk taken.